Serving your ice cream in creative ways, is a great way to increase your customer base and give your store a unique selling point. Here are some clever ways to serve your ice creams beyond the usual ice cream cups. Ice cream cake – You could add a number of favourite ice cream flavours, together with thin layers of cake. For example you could create a rainbow ice cream cake with a few layers of coloured pound cake. Cake sandwiches – Cake sandwiches are a creative way to add texture to an ice cream dessert. You could use plain thin slices of pound cake or slices of waffle. If you prefer to serve a simple cake sandwich, cut slices of good quality bread, preferably one that has nuts and dried fruit and add your choice of ice creams as the filling. 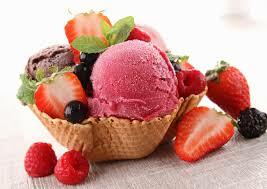 Ice cream bowls – Ice cream bowls these days are usually edible. You could choose from edible cupcake, cookie, chocolate or waffles bowls/cups. They require very little cleaning, since the bowl is eaten by the customer. You will however need to provide ice cream spoons. Serve your ice cream with coffee- You could serve your ice creams with coffees. Cappuccinos with a scoop of vanilla or flavoured ice cream, is a great way to give your customers a coffee fix and ice cream at the same time. Other options could include large milkshakes, mixed with coffee and ice cream. In the market for a supplier of ice cream shop supplies? Gelato Products will have what you want.